From Greenland’s vast size and diversity of landscape to her welcoming people and vibrant city, it’s a staggering place on so many levels. For the adventure traveller, few places compare - go now before the crowds! The landscape does not disappoint, but Greenland is not a museum – modern society is a surprising mixture of traditional and modern. Most people outside the capital live in smaller coastal communities in cheerfully painted houses, nearly everyone is on Facebook and subsistence for many still plays an important part in the diet. However, they are still outdoor people at heart with a great love of fishing, hunting and being out with their dog team. Life for many is still tough - particularly during the long winter months when communities can be cut off for up to seven months - but this is accompanied by a cheerful and hospitable attitude. 82% of Greenland is covered by a massive ice sheet that in places is almost two miles (3.2km) thick and around the edges you can gaze up at ice cliffs that are 100,000 years old. The landscape features stunning fjords, glaciers and tundra, with many mountains rising to well over 10,000 feet. The country’s relatively few inhabitants are scattered along the thin ribbon of coastline, with about 16,500 of them - around a quarter of the total - living in the capital, Nuuk. The whole northeast region Greenland is a national park – 100 times bigger than Yellowstone and about the same size as France and Spain combined. It’s by far the world’s largest. It’s obviously cold, but the weather is far more complicated than this – you must be prepared for surprises, not least as conditions can change suddenly. Being so large there are considerable variations from one region to another. Also there can be a big difference depending on whether you're inland or out at sea, on the coast or exposed out on the tundra. The mean 24 hour temperature remains below +10° C (50° F) in June, July and August in just about every town in Greenland, whilst all places are below freezing from November through to April. The sun doesn’t set from May 25th to July 25th - the time of the Midnight Sun - and in the summer months there are several places where day temperatures can exceed 20° C (68° F). 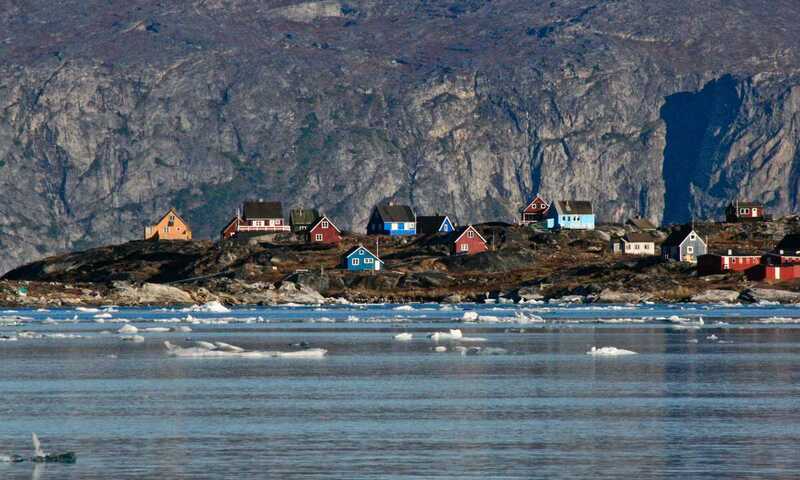 With a population of 56,000 people - all living around the coast, mostly in West Greenland - Greenland is the least densely populated territory on the planet. Outside the capital, most people live in tight knit communities of 50-500 people, often cut off from their nearest neighbours by distance and a lack of connecting roads. The local store has supplies that are shipped or flown in, but hunting and fishing are an essential part of daily life and remain a big part of the culture. Approximately 89% of the population are Greenlandic Inuit, descended from the Thule people who began colonizing the island around 900 AD and who introduced both the kayak and dog sled. Since the way of life was traditionally nomadic and there’s no shortage of land - the concept of land ownership simply doesn’t exist in Greenland. Roaming Greenland’s tundra and ice are polar bears, musk ox, reindeer, arctic fox and mountain hares. The shoreline and waters are visited by, or home to, five different species of seals, 15 types of whale, plus walrus. And birdlife include white-tailed eagles, ptarmigan, fulmars, auk, duck and geese – with 60 species breeding in the region. Having said this, the chance of seeing much wildlife is slim. Hunting for food is a regular part of Greenlandic life, so wildlife tends to be shy. Other parts of the Arctic provide better opportunities for seeing wildlife. For almost 5,000 years the Inuit have survived by hunting and fishing – the climate and short summers making effective farming virtually impossible. In the smaller towns and communities these two industries continue to be the major occupations. Cod used to be the main catch, but now Greenland is the world’s largest supplier of cold-water shrimps, while Greenland Halibut is also a mainstay of a commercial fishing fleet. In recent years, tourism has taken off as increasing numbers of adventurous travellers are drawn to Greenland. The first people arrived here about 4-5,000 years ago, travelling east across the frozen strait and arriving at Thule in northern Greenland. At least half a dozen other waves of immigrants followed and today’s locals are descended from those who migrated here around the 9th century AD. The Norseman Eric The Red arrived around 982, returning to Iceland three years later with stories of a “green land”. His salesmanship successfully attracted many settlers and various Viking settlements survived in the south for about 400 years. In the 17th century, European whale hunters regularly came ashore and in the 18th missionaries and traders from Denmark and Norway settled the coast. In 1814 Greenland became a Danish colony, was recognised as an autonomous country in 1953 and became self-governing in 2009. Full independence is a dream of many locals, however the country is still heavily dependent on Denmark. The Arctic is so vast and diverse that one of the biggest challenges is knowing where to begin. Our exclusive guide will help you get started with your travel plans. We love Greenland for its sheer diversity - each region is totally distinct with its own character. Even the language between east and west Greenland is substantially different. Discover a modern and cosmopolitan capital of just 18,000 gregarious and welcoming people dwarfed by a natural wilderness of savage beauty and awesome scale. Venture to remote communities that still subsist by hunting and fishing. Satisfy your thirst for adventure with a host of Arctic activities, from dog sledding to trekking and kayaking. Marvel at fjords littered with every shape and size of iceberg or camp on the gigantic icecap under the Northern Lights. This is truly the edge of our world, a region whose harsh climate and almost impenetrable mountains make human existence so difficult that it’s virtually uninhabited. Explore Scoresby Sund, the world’s largest fjord system, and visit tiny Ittoqqortoormiit, Greenland’s most remote community. North of here is the world’s largest national park, who’s dramatic fjords are briefly accessible each year only by expedition ship. For remote wilderness and majestic scenery, East Greenland is very hard to beat. In a whole week, the only people we saw was when we made a brief stop at the village of Ittoqqortoormiit. What language is spoken in Greenland? Greenlandic is the official language, but almost all also speak Danish and English is also quite widely spoken. Greenland’s visa regulations are the same as those that apply in Denmark. The good news is that no visa is required for EU, US, Canadian or Australian nationals. Where can I stay in Greenland? While Greenland’s hotels aren’t a reason to visit, most towns of a reasonable size have a modest choice of 3* options. There are only two hotels in the whole country which can claim to be ‘luxury’, however there are far more can boast far better views than most 5* hotels anywhere in the world. For accessing Greenland’s dramatic and largely inaccessible coastline, travelling by expedition ship is a very good option, with the boat acting as your floating hotel.